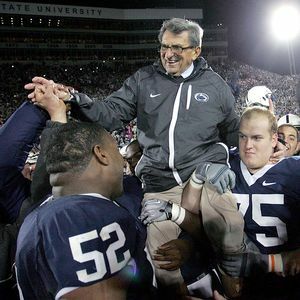 Quote of the Day: "People ask me why I've stayed here so long," Paterno told the crowd of 104,147, none of whom went home. "Look around! Look around! I love you all... Now that the celebrating is over, let's go beat Ohio State!" -- Joe Paterno, Coach of the Penn State Nittany Lions, as Penn State held an on-field ceremony that included a video tribute and a crystal football given to the coach to commemorate win No. 400. Monday - Socratic discussion about the articles they read on Friday in class (juniors). Discuss our trip to SFA & also check college applications & scholarships (seniors). Go outside to take class picture, if weather permits and it is a nice day.